On March 3rd, a diffusion event organized by the European Road Federation about works carried out on New Jersey project (New Generation of New-Jersey safe barriers using recycled materials and rubber form end-of-life tyres) took place. 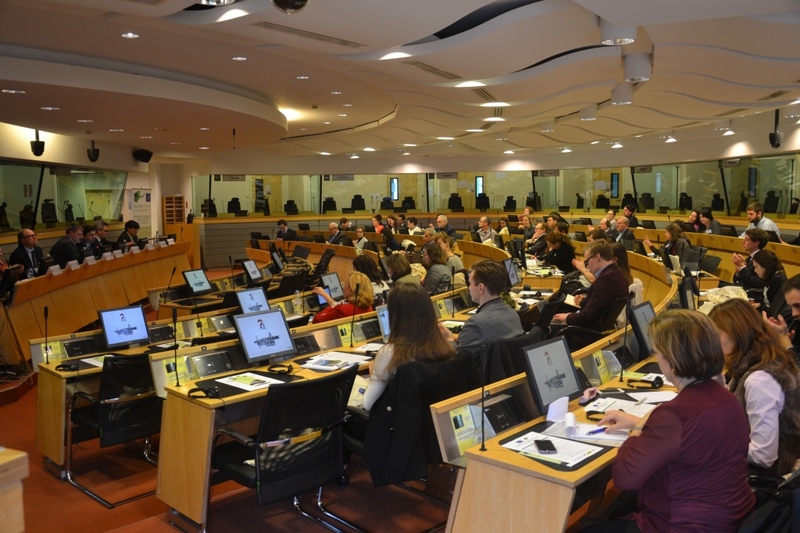 This event was held in Brussels, at the Committee of the Regions, the EU’s Assembly of Regional and Local Representatives, matching a meeting of the Environment, Climate Change and Energy (ENVE) group of the Committee of the Regions. All New Jersey Project works were summarized by the Region of Madrid General Roads Directorate, as well as other Research projects supported by the Region of Madrid on Infrastructures. Besides the main results of New Jersey Project, other Projects related with sustainable Infrastructures and efficiency were introduced by Acciona, Signus, and Cidaut Foundation, some of them related to LIFE + Program. Cidaut Foundation made a review on Regional concerns of the Green eMotion project results, by showing a successful implementation of electric mobility schemes, as well as the standardization road map, as proposed by Green eMotion parners. Additionally, the Illumetric system for luminance and illumination efficiency assessment was introduced, showing several case samples of the way it can help reaching an effective public spending. Besides these projects speeches, new Life Programme 2014-2020 details were introduced by DG ENVI European commission member, Mr Hervé Martin, as well as the new Public Procurement Directive, oriented to boost innovative solution on public contracts. Next steps on New Jersey Project will be the implementation of one of the barriers developed on a Road on the Region of Madrid, dedicated to evaluate actual in-site performance. This implementation will be installed during March 2015 as a permanent barrier, and will be monitored the following months, for evaluating its performance. New Jersey Project is scheduled to end on July 2015.